Brilliant green is a weapon of choice for many pro-Kremlin activists. A famous Russian writer Lyudmila Ulitskaya was assaulted when she was on her way to judge a history competition for high school students that was perceived as ‘anti-Russian’, not to mention assaults on oppositional journalists and bloggers 1, 2. It’s not even the first time Navalny was assaulted this way: in March, he was attacked in Barnaul. That is why some protesters against corruption in Russia were carrying signs ‘Go Green’: they expressed support for Navalny’s anti-corruption investigations and even compared him to different green superheroes. Why use zelyonka? Apart from marking the person for some time as an anti-Kremlin individual (with connotations of anti-Russian), it also infantilises the attacked person, because zelyonka is something most Russians know as a childhood remedy that is arguably less painful than iodine (I beg to disagree). This green marking is not just a sign of disrespect – after all, flour, eggs or even shoes are quite common ingredients on the bodies of controversial politicians. But branding oppositional figures this way also harks back to a much more sinister practice of human branding. Burnt letters on faces, tattoos, ripped off nostrils and ears are just some of the ways our enlightened society used to treat convicted criminals. 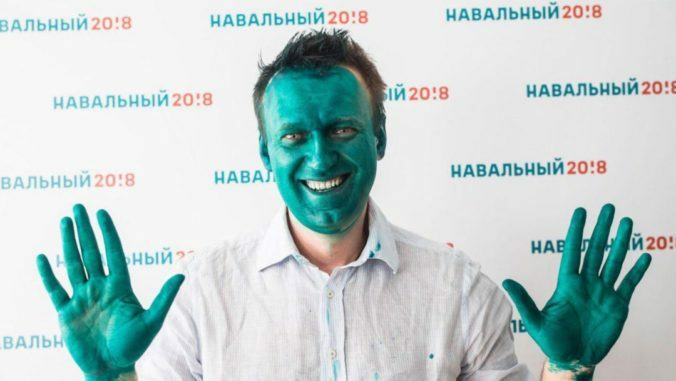 Navalny’s crime, however, consists in the intention of running for President of the Russian Federation. The practice of splashing an individual with brilliant green has an ominous genealogy and should have no place in Russian politics. I am still on the fence with flour and eggs though: as John Oliver noted, at least you can make a decent crepe out of them.